Oil / UV Dye Injectors. 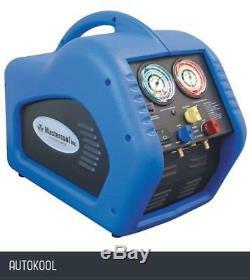 Mastercool 220v Air Conditioning HVAC Refrigerant Recovery Machine 69000-220. These Recovery Systems Are Compact, Lightweight , And Work With All Refrigerants. They're Ideal For Commercial, Residential Or Industrial Appliance Applications. The Mastercool Recovery System Offer A State Of The Art 1/2Hp Oil-Less Compressor With A Built-In High Volume Cooling Fan. This Innovative Design Delivers Maximum Cooling Efficiency Which Keeps The Compressor Working At High Capacities In Even The Hottest Climates. The Compressor Is Also Protected By An Automatic Low-Pressure Cut-Off Switch That Shuts Off The Unit Once The Recovery Is Complete. This Auto Shut Off Feature Eliminates The Risk Of Compressor Failure And Reduces The Users Need To Monitor The Entire Recovery System. All The Mastercool Recovery System Offer The Colour-Coded Gauges With Pressure Readings In Psi, Bar, And Mpa. The Stainless Steel Ball Valve Designed Manifold, Controls The Flow Smoothly And Quickly With Only 1/4 Turn. All This Is Protected By A Reinforced Hard Plastic Case, Mastercool'S Recovery Systems Will Meet All Your Refrigerant Recovery Needs. Safety High-Pressure Cut Off Switch. High Volume Cooling Fan Design. Fully Reinforced Hard Plastic Casing. Specifications: 1/2 Hp Oil-Less Compressor Recovery Rate: Direct Vapour Up To 12Kg/H Direct Liquid Up To 71Kg/H Push-Pull Up To 326 Kg/H Operating Temperature Range: 0 To 50 deg;C (32 To 122 deg;F) Weight: 16Kg (38Lbs) Dimensions 432Mm X 254Mm X 305Mm Refrigerants: Cfc'S HCFC's, Hfc'S. All deliveries are traceable and most will require a signature so please ensure someone is present to sign for your item. The couriers will try and deliver the item twice before returning the item to us. We promise to do everything we can to ensure you receive your order within the time-frame specified. Occasionally events beyond our control may result in your parcel being delayed whilst it is with the courier and we cannot be held responsible for such delays. 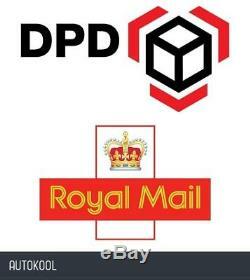 All items are sent using a tracked and traced service. All claims for missing items must be made within 28 days of the date of your order. First check these messages as they will indicate the status of your package. Please note that we do not dispatch orders on weekends. Expedited options are available for all products. Please note we use an automated order processing system minimising picking and packing errors. Once placed we cannot be held responsible for incorrectly ordered items. We are unable to upgrade or change any services. Customers should satisfy themselves that any item choice made is suitable for their intended purpose or use. We pride ourselves on our customer service. Please make sure correct details are completed prior to confirmation. We're a UK based company offering quality items at prices far cheaper than the high street. Autokool Ltd has a great reputation supplying the local garages and businesses with over 20 years experience in the motor trade. We have a great understanding of vehicles and the products we sell & can source most items for all jobs that you are likely to encounter. We do not despatch items at the weekend or over Holiday periods. We pride ourselves on our feedback record & will attempt to resolve any issues to the best of our ability. 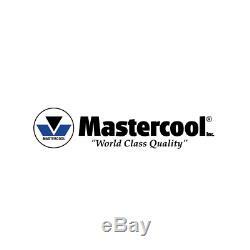 The item "Mastercool 220v Air Conditioning HVAC Refrigerant Recovery Machine 69000-220" is in sale since Friday, January 20, 2017.